Home > Blog entry > Constant dripping wears away the stone. Kyrgyz parliament votes to renegotiate Kumtor gold mine contract. Constant dripping wears away the stone. Kyrgyz parliament votes to renegotiate Kumtor gold mine contract. Challenging a mining operation that generates about ten percent of GDP in a country and particularly doing so on environmental and social grounds is an intimidating task. But as the example of the Kumtor gold mine in Kyrgyzstan shows, indefatigability and scientific expertise can persuade decision-makers to defend the interests of a country and its people. The Kyrgyz Parliament today voted [ru] to renegotiate a contract signed in 2009 [*] with Canadian Centerra Gold Inc. for the exploitation of the Kumtor gold mine, near the border with China. The parliamentarians invoked, among others, serious environmental concerns to motivate their decision, which can be considered a success for local activists that have been for years campaigning against the negative impact of mining by Centerra. In the environmental part of the report, the State Commission argues that mining by Centerra has caused irreparable damage to nearby glaciers, including destroying the largest glacier in the area, Davidov. 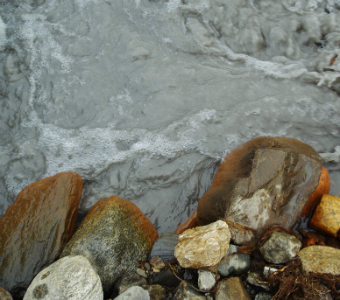 Results from German and Slovene laboratories show that mining activities have led to the pollution of the Kumtor, Taragay and Naryn river basins and will continue doing so if no measures are taken. At the moment, there is considerable risk that the dam on Lake Petrov might break because of pressure from mining operations, leading to a disastrous spill of tailings downstream. The reassessment of the terms on which Centerra can mine in the future is good news also beyond current threats. The new open pit mines planned by Centerra would negatively affect more glaciers in the region. In addition, the company is at the moment exploring territories which intersect the territory of the Sarychat-Ertash nature reserve, permission to which was approved in 2009 and revoked in July 2012 by the Government. A reassessment of the contract might also make Centerra more inclined to abide by decisions that limit its activities. In addition to environmental harm, the State Commission told the Kyrgyz legislators that the deal with Centerra never brought considerable benefits for Kyrgyzstan (although the Kumtor mine is the main profit-generating project of Centerra, responsible for 92 percent of the Canadians’ income in 2011; and a profitable year that was!). The Commission advised Kyrgyz authorities to renegotiate the contract, investigate the conditions under which it was signed, and adopt measures necessary to avoid similar mistakes in the future. The company has indeed enjoyed shockingly favourable terms, to mention but a few: a generous tax regime, fixed environmental charges (USD 310 000/year), an extended allowance to operate the open-pit mine until 2026 and very low payments for future recultivation works after the mine’s closure. These come on top of other beneficial conditions like the high gold component in the ore (on average 2.9 g per ton and more), relatively low spending on the gold production (502 USD/ounce) and a bulk of proven and probable remaining gold reserves (about 900 tonnes of gold compared to 260 tonnes produced 1997-2011). The decision taken by the parliament today should serve as a wake up call, both for all Kyrgyz authorities with any influence on the direction of the country’s development, and to the international financiers of Centerra (including the EBRD, which in 2010 extended a revolving debt facility to the company). The voices of citizens and civil society groups – which have been for years sounding alarm bells about Centerra – cannot be shoved aside by claims about bringing sustainable development to a country. On the contrary, they should be involved in these decisions from the very start. * The 2009 deal is just the most recent form of the contract between the Kyrgyz state and Centerra. 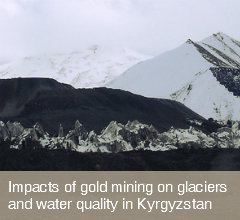 It offers the Kyrgyz state a 33 percent of the company and a minor share in Centerra Gold.